The master bedroom is coming together, slowly but surely. You know I like to take my time, bring things home to try them, touch them, see them in the space, etc. I think I have already brought home 3 sets of lamps and 4 throw blankets, all which have since been returned. This is another reason I am not a huge online shopper which I’ve talked about before. Patience is the key for me. Find what you like, not what is convenient. Buy new when needed and be creative with what you have when you can. When in doubt, bring things home and try them out! Since we last talked about the master, curtains have been hung, a bench for the foot of the bed has been purchased, a headboard has been installed, and new hardware has been screwed into the existing furniture pieces. Window Treatments: We installed the light bamboo shades a few weeks ago and I love them! They add so much texture to this large space. I mentioned before that I am going to reuse four Ikea panels and trim them out. That will be one of the last things I do after everything else comes together. Until then, at least they are hung! The curtains are long, and I might end up hemming them, but I kind of like that they pool the ground. I had hubs hang them to the ceiling to add height. The curtain rods are from World Market. They had these on sale one day when I was there, and I had an additional 10% coupon, making them very inexpensive. I decided to go with these Wooden Ball Drapery Rods. They are dark wood which is a good contrast to the lightness going on with the shades and drapes. They also coordinate with the furniture we are reusing. Bench: I also found a bench at World Market that I fell in love with! It’s intended to be a dining room bench, but it works equally as well as a foot of the bed bench, or a casual bench to sit on in a living room. It was also on sale for $229 (originally $279), and I had another 10% off. I love this bench for several reasons. It’s long. It almost extends the entire length of our king sized bed. It’s tufted. It’s neutral. It’s classic. It’s sits on brass casters. It looks more expensive than it was. It sort of reminds me of our RH dining room chairs. Headboard: I randomly stumbled upon this next purchase last week while browsing the aisles of Tuesday Morning. Who knew they sold large, tufted, linen, KING sized headboards in store?? With a price tag of $349, we borrowed a truck and snatched one up! We were going to reupholster our old headboard (which was a DIY), but for this price, we thought it was a no-brainer to go ahead with this one. I will be reusing and reupholstering our old headboard and using it in the guest bedroom (let’s be honest and say I won’t be getting to that for a while)! This headboard attached right to our bed frame and we have been enjoying it for a few days now. Instant texture and drama! Things are still very random in the master, so I will show pictures in the room as more styling occurs! Hardware: We decided to reuse a dresser and night stand from the set we have had for 11 years. It is dark wood, and actually is a good contrast against our very light carpet and smokey blue walls (and now light headboard). It is one of those sets that is still sold in every furniture store across America, but nothing I would ever actually choose nowadays. Over the years, we ditched the sleigh bed and armoire, but we very much still use the night stand and dresser and it’s in great shape even after 11 years and 6 moves! 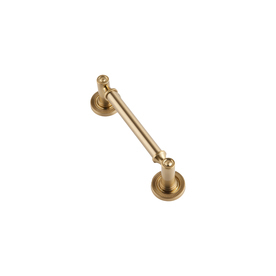 So, in an effort to reuse what we have, we decided to purchase new brass hardware (I’m brass obsessed!). I needed 14 of these new pulls for both pieces of furniture, and at $6 each, this update came in at about $85. These are from Lowe’s! You can find these pulls here. Shipping was fast, and we love them! Again, they are classic and the brass adds a little “jewelry” to the furniture. So much better than the dark, ornate pulls that were original! Dare I say I don’t even mind the furniture anymore? Love when that happens! Love the headboard and bench!! I can't wait to see your room finished.